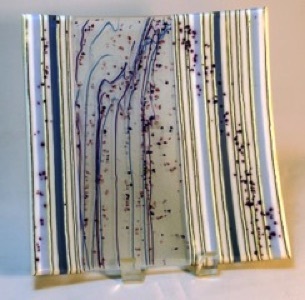 Merrilee Harrigan took her first fused glass class in 2003 and was immediately hooked on the beauty and creative process of glassmaking. 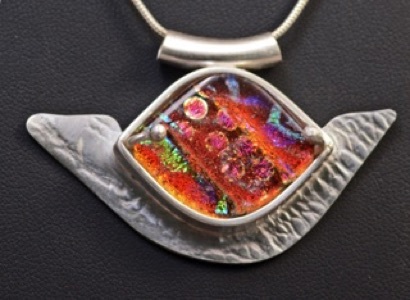 She initially focused on glass jewelry, and in 2014 expanded her work to include crafting silver settings to add to her fused glass jewelry. She works out of her home studio in Washington DC. Creativity has been the common thread in her winding journey through life, and fused glass has proved to be the most exciting, engaging and joyous expression of my creative spirit. Her glass is inspired by the brilliance and subtlety of color in glass, by the graceful and sometimes unexpected way that glass flows, and by the unending ways to create beauty and meaning through glass. The unique complexities of glass – the way it flows when heated, the chemical reactions between colors, the effect of air and metals in glass – ensure that there are always new things to learn and frontiers to explore.